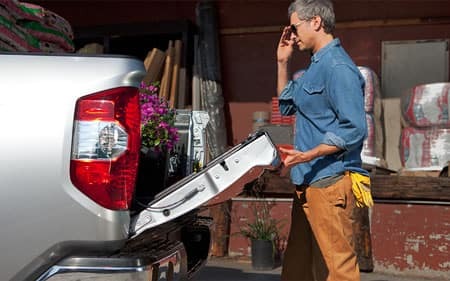 Engineered to meet the demanding needs of full-size pickup buyers, the Toyota Tundra offers powerful performance, rugged durability, and unmatched capability to help get the toughest jobs done. Proudly assembled in San Antonio, Texas — the Tundra gives drivers their choice of an economical 4.6L V8 or a muscular 5.7L V8 to suit their needs. You’ll have the ability to choose from two cab configurations along with three different bed lengths, giving you plenty of possibilities to design your Tundra to match your lifestyle. 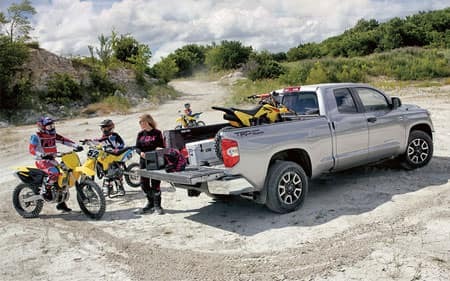 A largest-in-its-class 38 gallon fuel tank, massive front brakes, and an available towing capacity of 10,200 pounds prove that the Tundra can handle any challenge standing in your way. For 2019, the rugged Tundra TRD Pro returns to the lineup with its unmated off-road capability, rugged forged BBS® wheels, and a TRD-tuned FOX® suspension. Looking for additional refinement and luxurious amenities inside your truck? You’ll find available perforated leather-trimmed seating surfaces and a variety of infotainment options to help you stay in-touch inside Tundra Limited, Platinum, and 1794 Edition models. 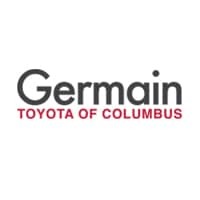 If you’re ready to take your Tundra to the next level, Germain Toyota offers suspension lifts, off-road tires, lighting kits, winches, and much more. After disappearing from the lineup last year, the Tundra TRD Pro makes its triumphant return sporting a bold exterior design to match its impressive off-road capabilities. Unique features of the TRD Pro include an aluminum underbody skid plate, specialized dual exhaust, TRD-tuned FOX suspension®, and 18-inch forged BBS® aluminum wheels. Inside the interior, TRD-exclusive accents help highlight the rugged style and strength of the Tundra TRD Pro. Inferno Red has been discontinued as an exterior color. The Toyota Tundra remains otherwise unchanged from the prior model year. Whether you’ve got a long day at the job site or a relaxing weekend getaway ahead of you, count on the Toyota Tundra to deliver the performance to take you further. Power comes in the form of either an efficient 310-horsepower 4.6L Aluminum i-Force V8 or a muscular 381-horsepower 5.7L Aluminum i-Force V8. Slippery situations are no match for the Tundra which features a standard Automatic Limited Slip Differential (Auto LSD). On four-wheel drive models, Active Traction Control (A-TRAC) improves traction across the front and rear axles automatically while giving you full use of a 2-speed transfer case. Equipped with the largest front brakes in its class, the Toyota Tundra has plenty of stopping power when you need it most. When equipped with the 5.7L V8, the Tundra includes an Integrated Trailer Brake Controller for improved control of what’s going on behind you. 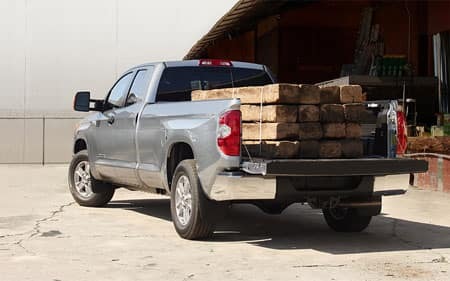 Giving the Toyota Tundra the strength to tow up to 10,200 pounds are outboard-mounted shock absorbers, a heavy-duty TripleTech™, and an integrated towing hitch. Other available features include supplemental engine oil and transmission coolers, dedicated TOW/HAUL mode switch, and a heavy-duty battery. A maximum payload rating of 1,730 pounds helps the Tundra carry even your biggest toys inside of a 5.5-foot short bed, 6.5-foot standard bed, or an 8.1-foot long bed. Listed below are a selection of Tundra models along with their individual capacities and capabilities. Inside the Toyota Tundra, both drivers and passengers will find the perfect space to escape the chaos of everyday life thanks to a perfect blend of luxury and ergonomics seldom found on a full-size truck. Instead of folding flat, its rear seats fold up to create a secure cargo area inside the cab for safeguarding your valuables. Get directions, listen to your favorite tunes, and access media with the optional Entune™ Premium JBL® Audio with Integrated Navigation and Entune® App Suite. Hitching up to your trailer has never been easier thanks to a standard integrated backup camera. On Tundra CrewMax models, a power rear vertical window is included as standard to help fill the interior with fresh air. 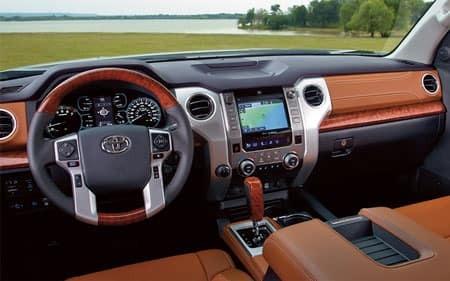 Giving you the ultimate in luxury, the Tundra 1794 Edition comes equipped with a Western-themed interior featuring brown premium perforated leather-trimmed seats. Regardless of your driving style, even the best of us can use a helping hand to stay safe from the unexpected on the road. This is the exact reason why every Tundra comes standard with Toyota Safety Sense™ P (TSS-P) — a collection of driver-assistive safety features. Technologies included are Dynamic Radar Cruise Control (DRCC), Automatic High Beams (AHB), Lane Departure Alert with Sway Warning System (LDA w/SWS), and a Pre-Collision System with Pedestrian Detection (PCS w/PD). The Tundra also was the first full-size pickup to offer an optional Blind Spot Monitor (BSM) with Rear Cross-Traffic Alert (RCTA), highlighting its commitment to keeping occupants protected. You’ll also find 8 standard airbags inside the Toyota Tundra.